Canada | What happens now? Perhaps one of the most important people to “come out” this year about suicidal thinking is Orlando Da Silva, the new head of the Ontario Bar Association. As soon as he took up the post in August, the trial lawyer started speaking openly to the media and others about his own attempt and recovery. “I was told the Toronto Star report was seen by 2 million people,” he says. On Friday, the bar association launched a project called Opening Remarks, which aims to put mental health front and center in the legal community. 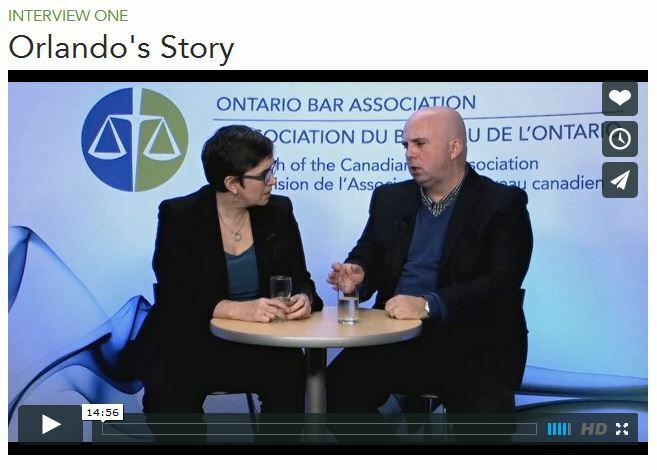 You can watch Orlando’s interview here, and he has started a series of interviews with other legal professionals. The first features the president of the Canadian Bar Association talking about her experience with depression. This week, the Canadian activist who tweets at @unsuicide takes us on a tour through the online world of crisis response, where the suicide awareness establishment acknowledges it’s still largely clueless. In the conversation ahead: social media suicide hoaxes, what Twitter does wrong, the need for transparency, why hotlines are outdated, why trained peers are crucial, and how to walk the oh-so-careful law enforcement line between tracking people down for help and scaring them away. We have three videos for you this week. But first, a couple of examples of deeply unhelpful responses to suicidal thinking. The videos have a more empowering message. Today’s post is by Sandra Kiume, a writer and activist who has turned years of personal experience into a spirited understanding of the ways peers can help one another. Morning in Toronto. Barb Hildebrand gets up, feeds the dog, has coffee and sits down to another full day of talking about suicide and mental illness online. Many who lose someone to suicide want to turn the experience into something meaningful. Barb lost her husband, Rob, over Christmas in 2000. Eleven years later, she created the Facebook page Suicide Shatters and turned it into the rare space where attempt survivors, loss survivors and those with mental illness mingle. On Feb. 27, she reached 10,000 members. What began as a few random posts has taken over her life and become her passion. Support groups: Where are they? For a person who’s tried to kill himself and is trying to understand what happened, there’s no awkwardness like Googling “suicide survivor support group” and walking into a room full of the bereaved. Welcome to our new look! We’re able to accept and moderate comments now, and they’re already coming in. This week’s post is by a young Canadian named Alicia Raimundo, one of a very small number of people who regularly get on stage and speak openly about their experiences with attempted suicide and suicidal thinking. She’s just one of two people we know who’ve done TED-related talks about it. Hers is worth watching, and so is JD Schramm’s. While Schramm’s story is more personal, Alicia takes a broader approach. Before handing today’s post over to contributor Judy James, we’d like to mention two changes that you should see this week, as well as an outside word of encouragement. First, the blog will have a new appearance for easier reading. And that will make it possible for you to post comments and for us to moderate them.